A lovely post again. I can’t believe the foxes like wine gum, that is pretty amazing I find. And I have to compliment you on the photos. Lovely compositions, colours are fantastic and the are so crips and clear. Thank you Inger! They look like a family. Thank you so much for reading, Cynthia! Thanks for reposting the link to this one, Inese. I hope I catch up with the new pictures now or when I’m back. 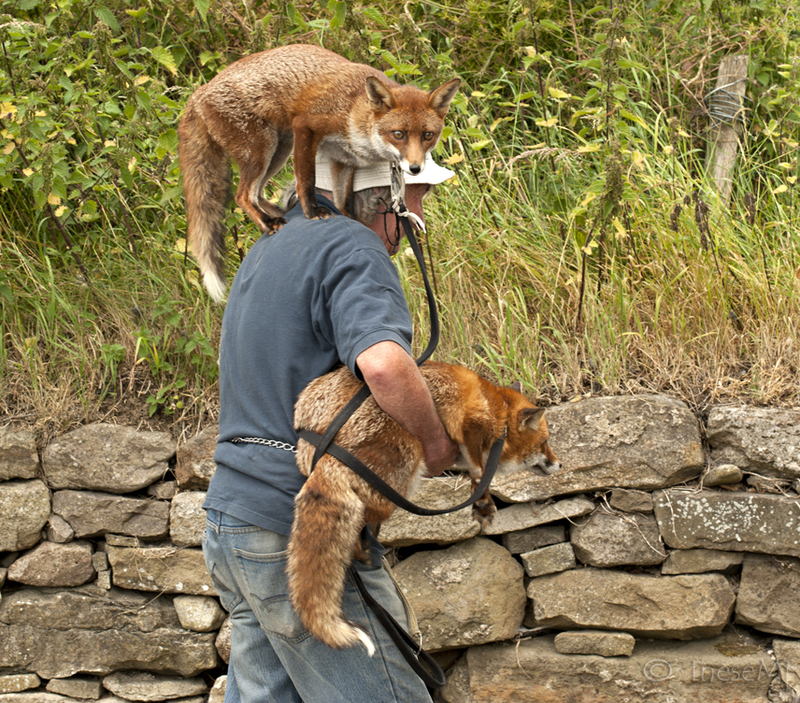 So interesting never could imagine foxes as domesticated pets. Lovely post. Thank you so much for your comment! These are rescued animals, and now a part of the family 🙂 They are not pets – if released they will run away as any wild animal does. Grainne run away once, but came back. Good that nothing happened to her: she could be killed by dogs, humans, or by some other wild foxes since she smells different. Thank you for your comment, Derrick! 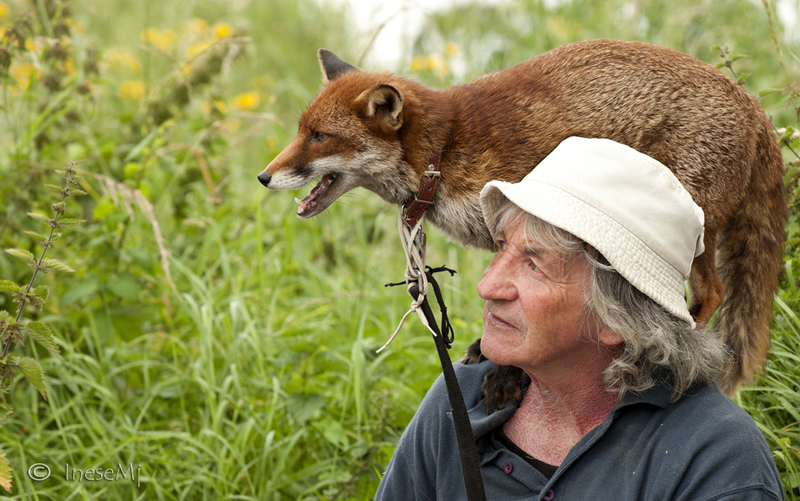 This was such a sweet tribute to a gentle fox friend and almost like Patsy is a fox whisperer! There is mutual respect and affection between them. Congratulations on your nomination and well deserved, Inese. Thank you so much for your comment! If everybody took time to think about the bad traditions that have to be ditched in the 21st century. Pat is an angel! His son and girls are adorable and obviously well cared for and loved completely. Your post made me smile and tear up a bit, as well. 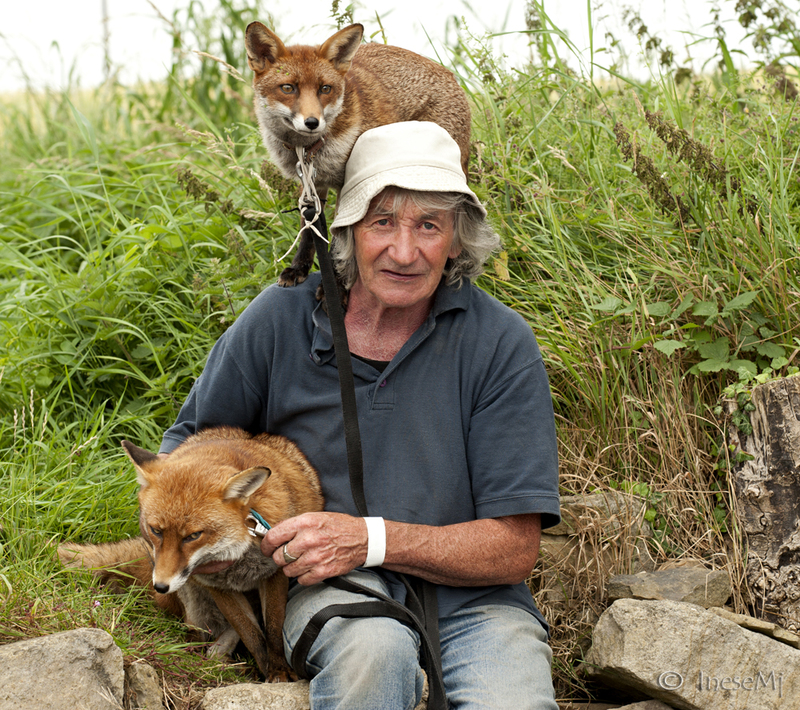 I hope Pat is on the mend, and the fox are back with their friend. 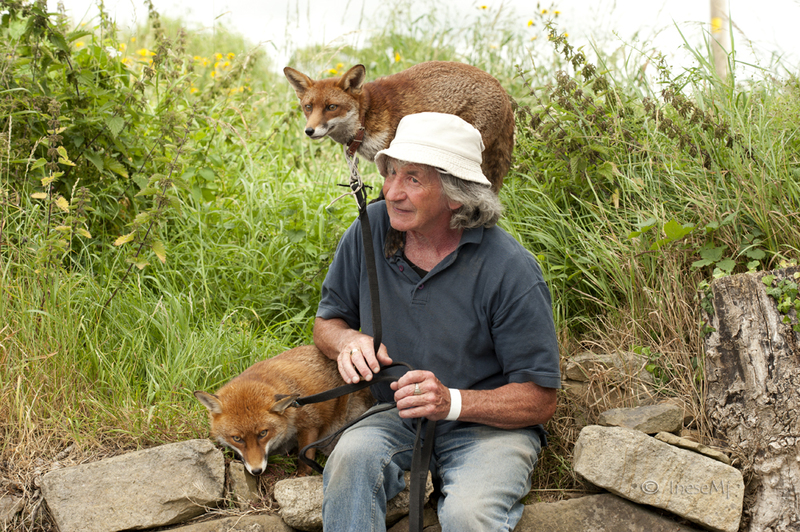 I think it’s not irresponsible of the media to write about Pat and his foxes. 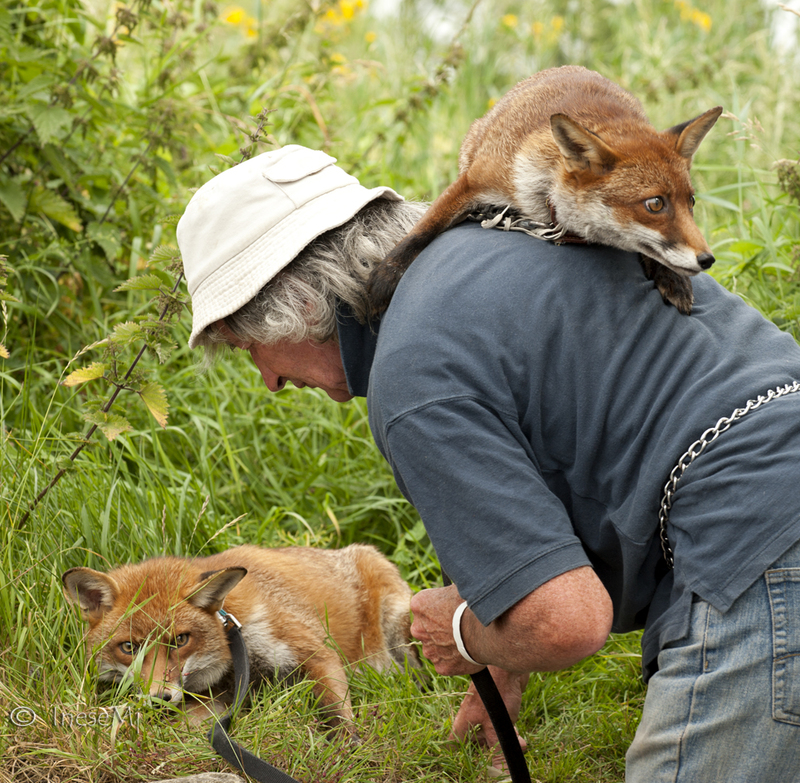 He’s caring for the foxes who were brought to him sick and/or injured. 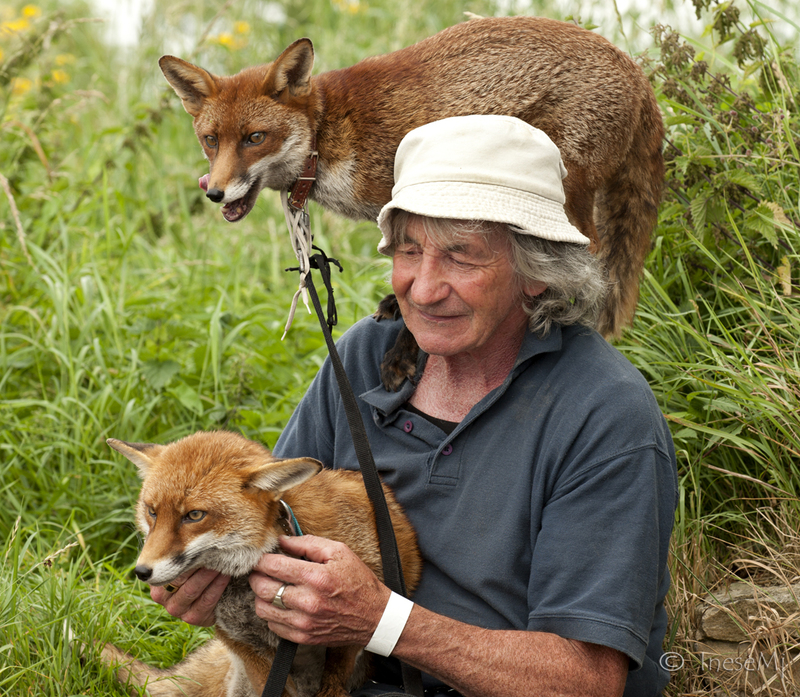 He’s not promoting them, making money off of them or encouraging others to have foxes as pets! 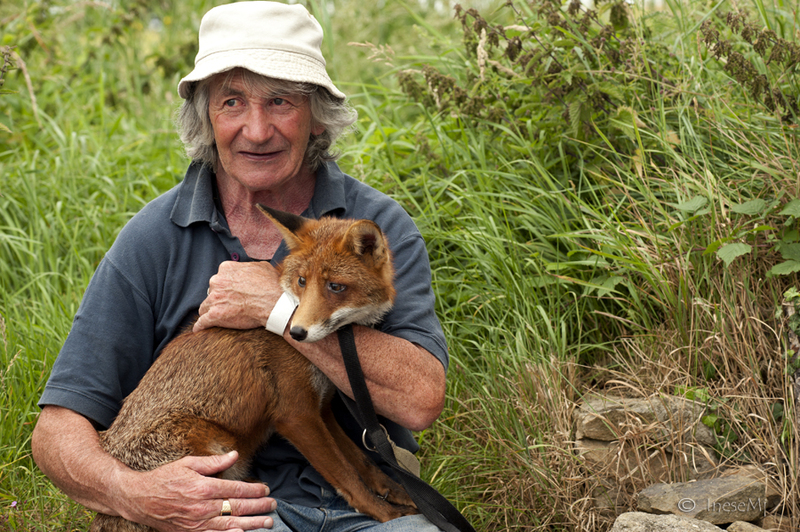 Hopefully, people can learn about foxes through Pat and learn that there are good people on this planet. Thank you so much for your comment! I am not the only one who read that silly article. A tourism related website from France recently posted a link to that article and a harsh comment. 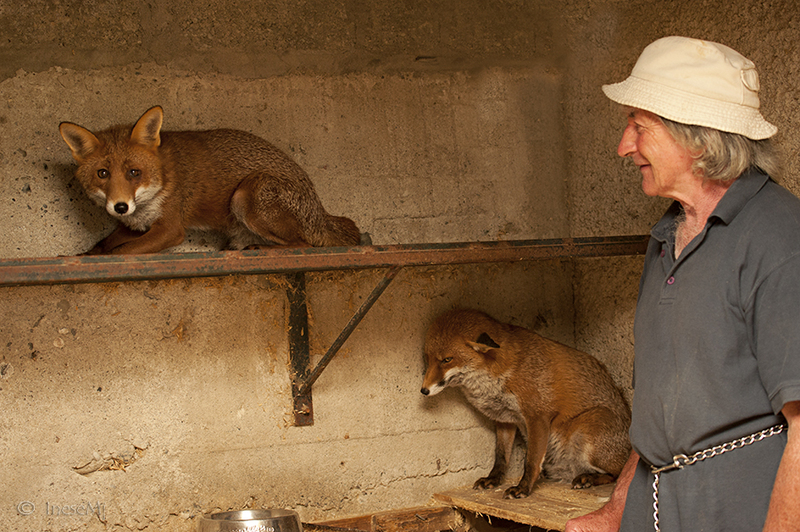 These foxes were not taken from the wild to be made pets. They were saved after being almost killed by people! 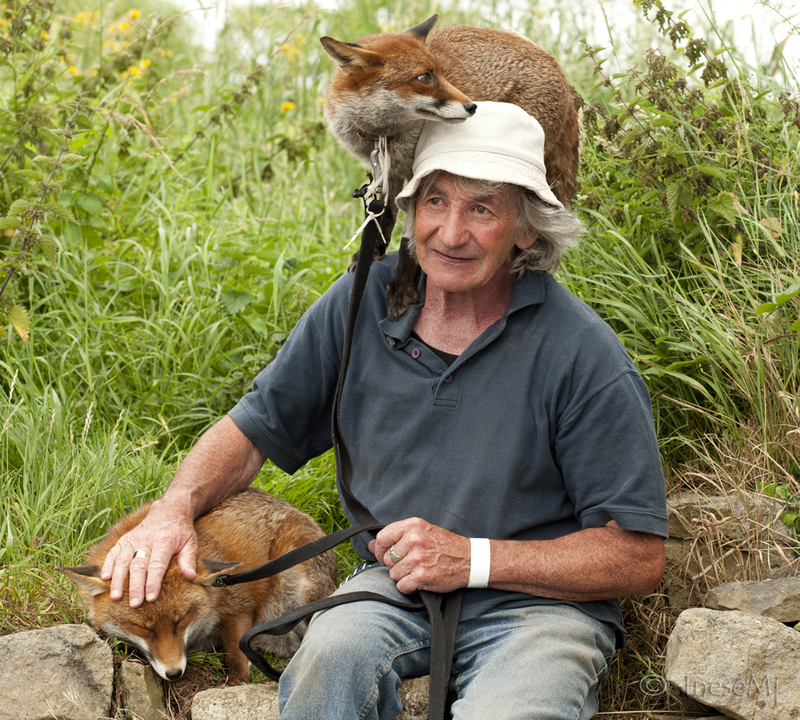 Pat is an advocate for the wild foxes, not for the pet foxes. Awww… I can’t believe i missed this post. So glad I found it just now. Glad you like it 🙂 Hugs! Amazing ! 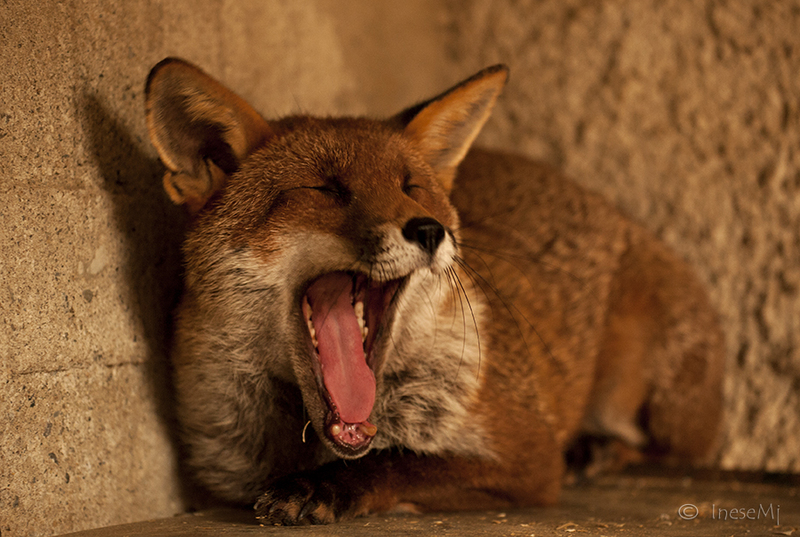 I love foxes I wish I has some as pets ! Inese – What a terrific series of pictures, absolutely beautiful. 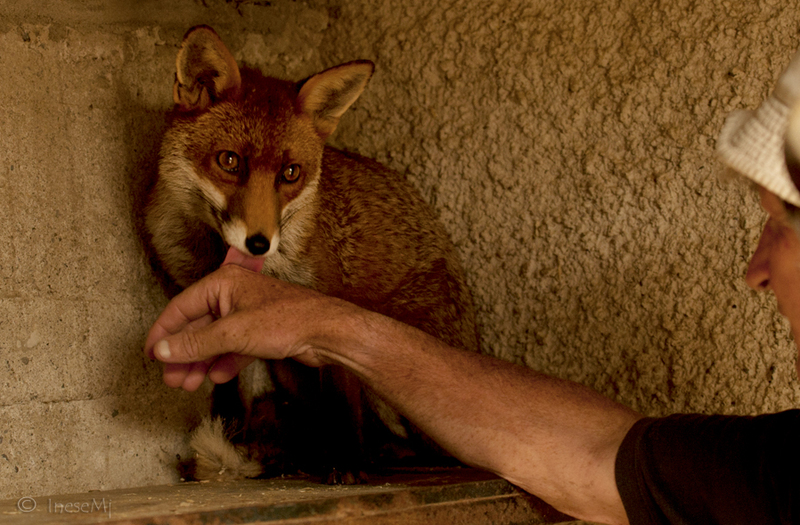 The love between Pat and the foxes is amazing. Congratulations on your award. You are highly deserving. Your hard work is truly showing everywhere. Sheri, thank you so much for your kind words! You are the one who inspired me to do more. 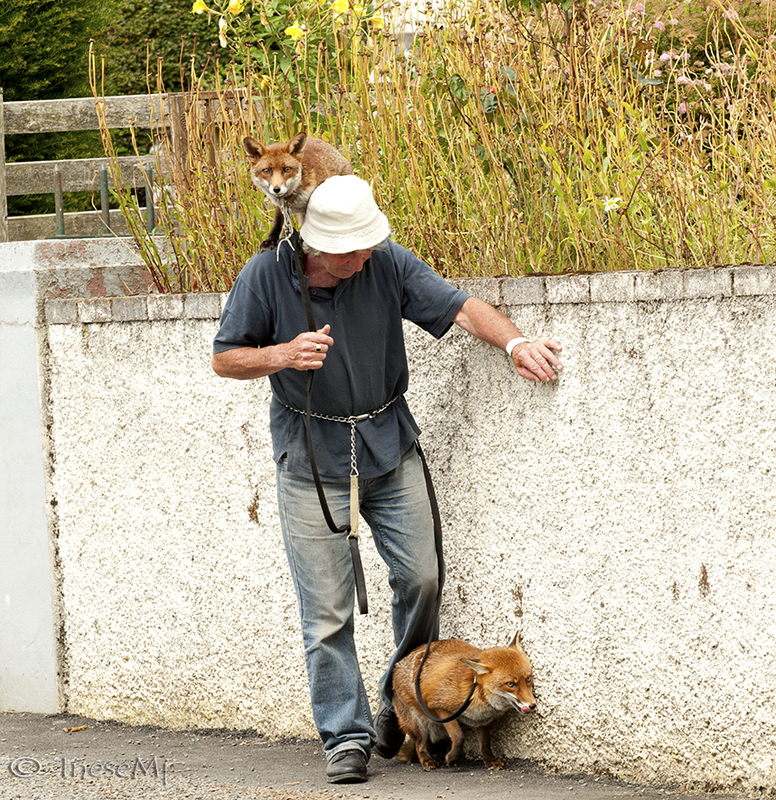 I had written about 10 short posts offline before I went live with a post about Pat and his foxes on April 6. I hope to visit him again in October. It is fun that I already got a telephone call from a person who caught a young fox in their chicken coop and asked if Pat wouldn’t have him. We agreed that the best she could do was taking the fox into the woods. Healthy and capable animal belongs to their habitat. Inese – Keep up the great work. You are a natural with your blogging skills. Your photography is some of the best I see and your ability to weave in a story adds an element pulling everything together that often escapes others. You have a depth of knowledge that never ceases to amaze me. BTW – I couldn’t gather herbs next to my wildflower garden last night due to the large number of honey bees in my wildflower garden. I didn’t want to disturb the bees and smiled when I saw them and of course thought of you. I’ve talked with my neighbor as he’d expressed an interest in building hives. Looks like my wildflowers will prompt him to go ahead with his plans. I’ll keep you informed. It is wonderful that the bees know your garden and can get some pollen without travelling miles. Beautiful pictures as always, but also what a character this man….in a good way that is. By the way, don´t the fox´s are a bit dangerous once they grow up. I just realised the profile picture! I thought it was a dog. Yep, she sure loves attention. Thank you Robyn for all your kind words. You can tell they are very dependent on Pat… stick to him like glue… bless them. Oh yes, they love him in a very humanly way, like little children. Thank you for stopping by! Thank you! :) Have a great week! I enjoyed reading about the foxes and Patsy. I hope that by now, he continues to feel much better. Thank you so much for this comment! I will find the article where this response was mentioned. It was an article in some National paper which brought this harsh response from the mentioned organisation, and also the fact that the local school invited Patsy and his foxes to teach the school kids about the wild animals ( exactly what you are talking about). All that made the Rehabilitation people mad. I would say that they just got jealous that this idea to cooperate with Pat wasn’t theirs. I was very upset reading that. 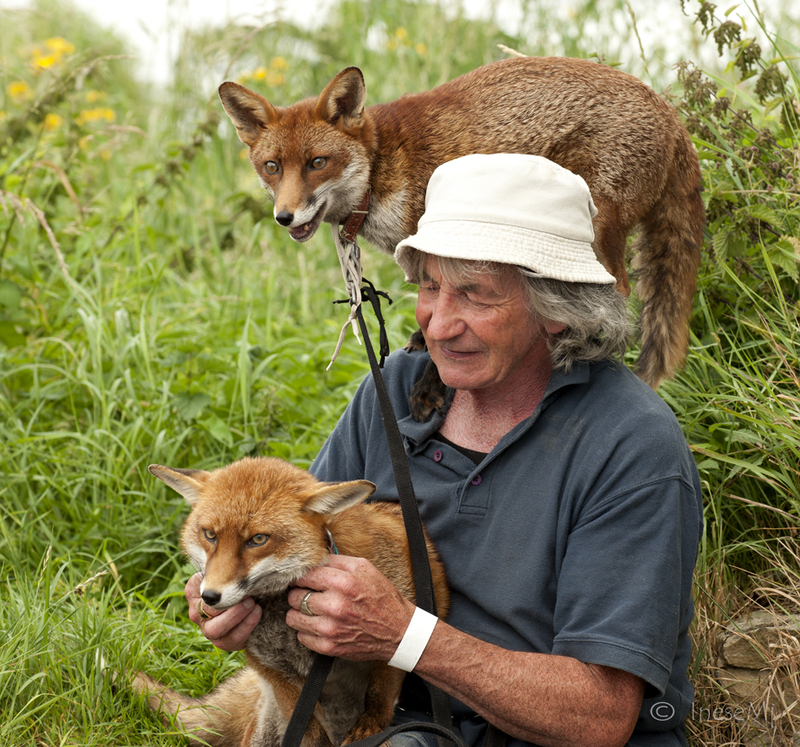 It is when I decided to go and see him and the foxes by myself. Thank you for your kind words! 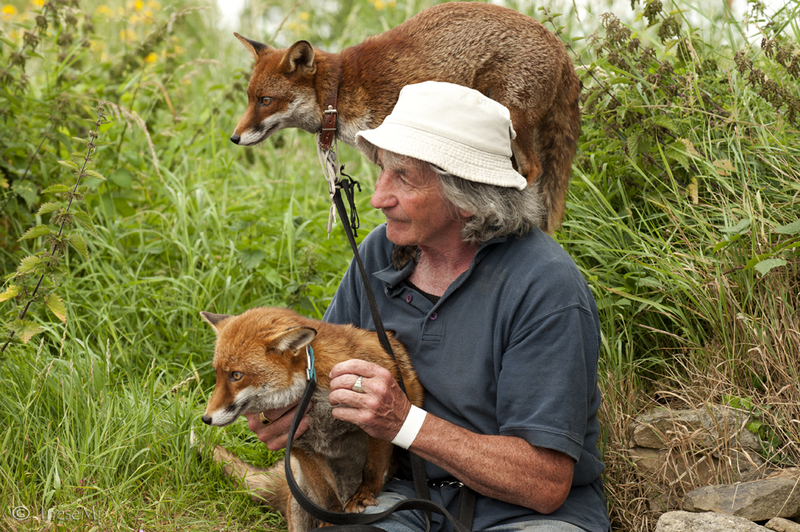 They trust him, and even that almost everybody can hold and pet them, I think it is only Pat with whom they would feel safe to go outside their den. You are right though, he has to train them to go for a walk with his brother, just in case. Two comment posts, sorry! Didn’t think the first one took, but I love this post enough for doubling up. 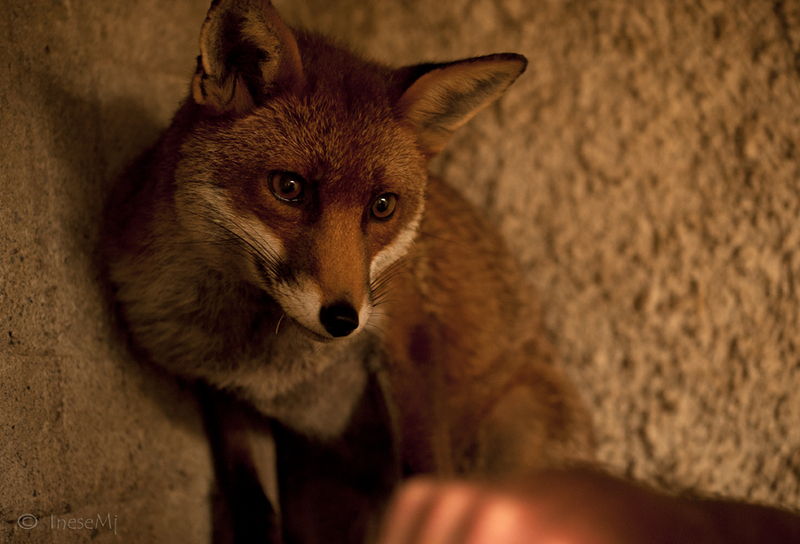 Wonderful fox portraits and story. Clearly, Minnie is not comfortable getting her exercise on the street with cars. No Hattie, usually she is all right:) She is a bit overweight and she really needs some exercises for her health, and Pat makes sure she walks every day. They do walk, together with the dogs, but these days everything is different… First of all, Patsy was away four days. It never happened before. No walks, no bath. And also I think that they can feel his worry, and his health problems too. 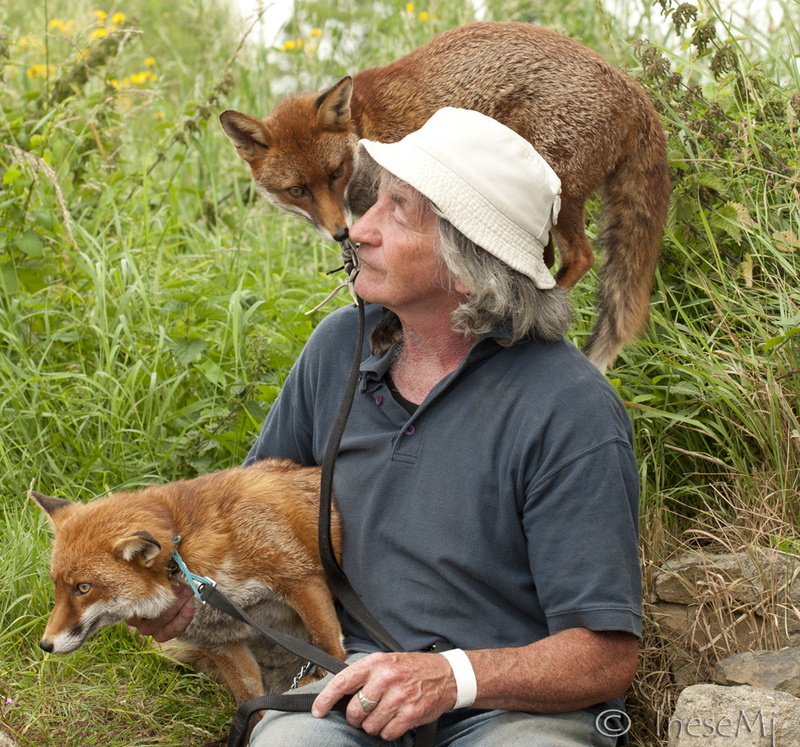 Minnie likes attention, but this time it was too much:) It looked very funny, all the faces she made and all her body language, but I could see that the foxes were different this time, and we just gave them some rubbing but didn’t pick them up, not to put more pressure on them. Pat says that he feels better now. So hopefully their routines will continue as normal. 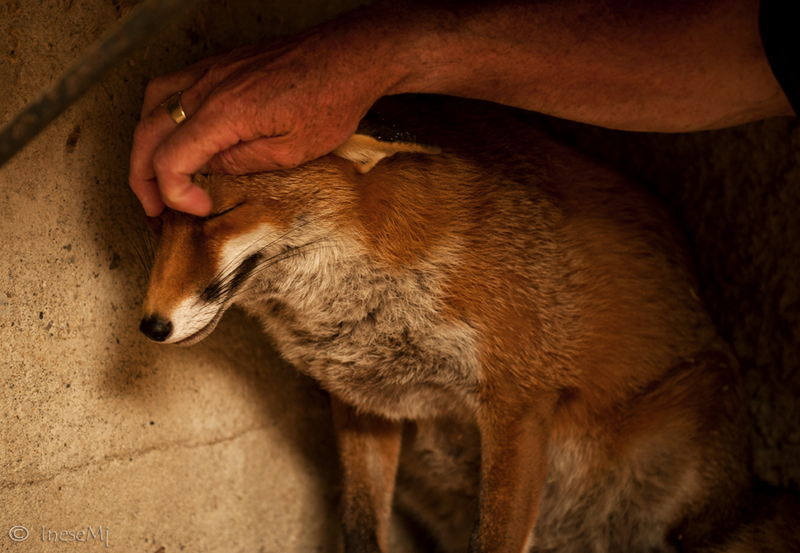 Beautiful portraits of the foxes. It looks as if Minnie doesn’t like getting her exercise on the street with cars passing. Me, either. This was a beautiful post – the images were spot-on and a lovely story. 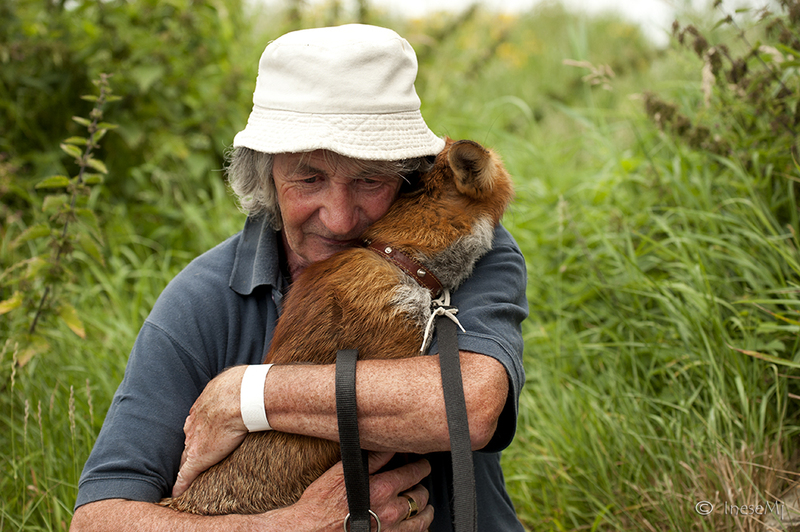 People like Pat should be commended for taking the time to care for injured animals. So agree with you, and thank you for stopping by! You should see them together, such an example for all humans. Great photos and what a character! 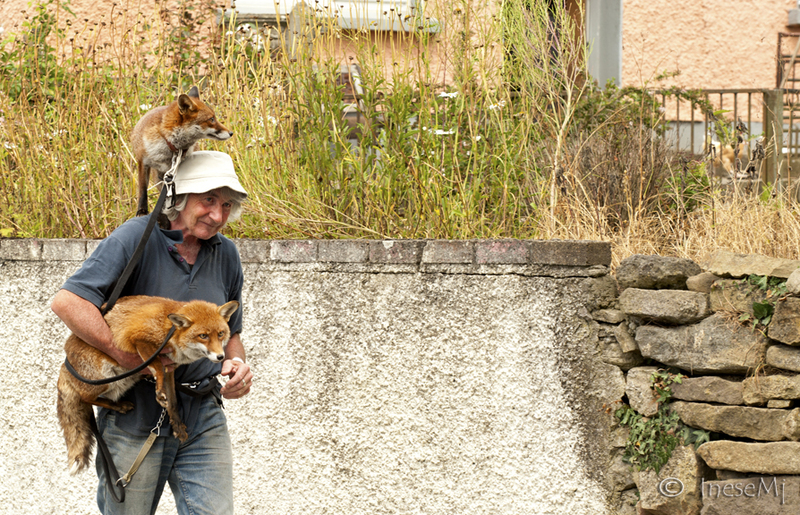 I can’t see what the problem is if these foxes were abandoned or hurt and he’s taken them in. Thank you for reading Andrea. I too don’t see any problem, but this was a response to an article in March this year, shortly before my first blog post. A very official response from an organisation I have never heard anything about before. I believe they do something sometimes, but I have never heard them educate the society. I think they have to sort out their own business first. Thanks again for your comment, have a great weekend! Gorgeous photos and a heartwarming post! I don’t know about your side of the Pond, but here in the U.S. it’s almost impossible to find an animal rehab establishment that will take “nusiance” animals. We found an infant raccoon and took care of him until he was able to eat by himself and then it took weeks to find someone to reintroduce him into the wild. Let the Wildlife Rehabilitation people grumble. This man rescued dying animals – he didn’t run to the pet store and buy a trendy, “exotic” pet! I so agree with you! No one would take these animals, no rehabilitation centre. And after he nursed them, would he give them away? They have a bond stronger than some humans may have. I will make a research about this centre anyway to learn what good they have done. Super-dooper cool, Inese! 🙂 That has to be fun for all involved. I bet Pat and his pets turn a lot of heads on their strolls about town. Thank you Andrew! I was trying to show the love in my pictures:) Have a great weekend! Thank you so much for this lovely little award. I just got word about it this morning from the WP app on my phone, and I gladly accept. In fact I’m writing the article at the same time as this comment. Multitasking huh! 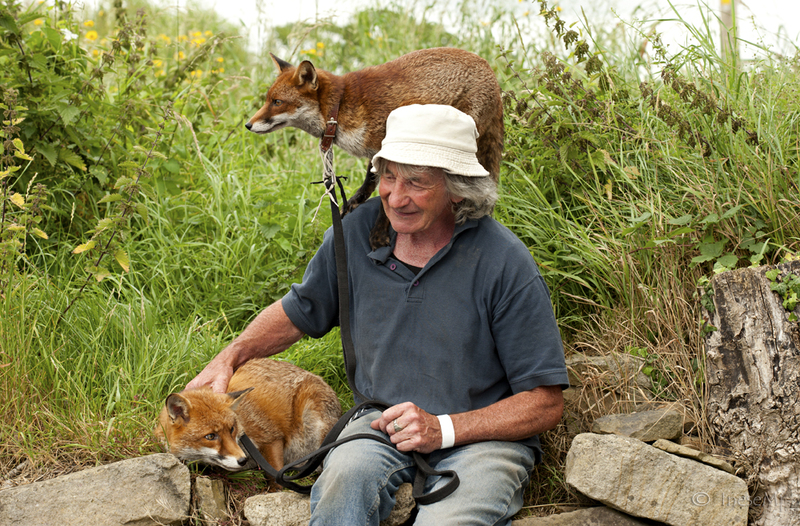 Also a beautiful article on the relationship between a man and his foxes. He clearly is devoted to them and its especially touching that he took them in when they were in a bad way and has always been there for them. Here in London, I often see urban foxes. 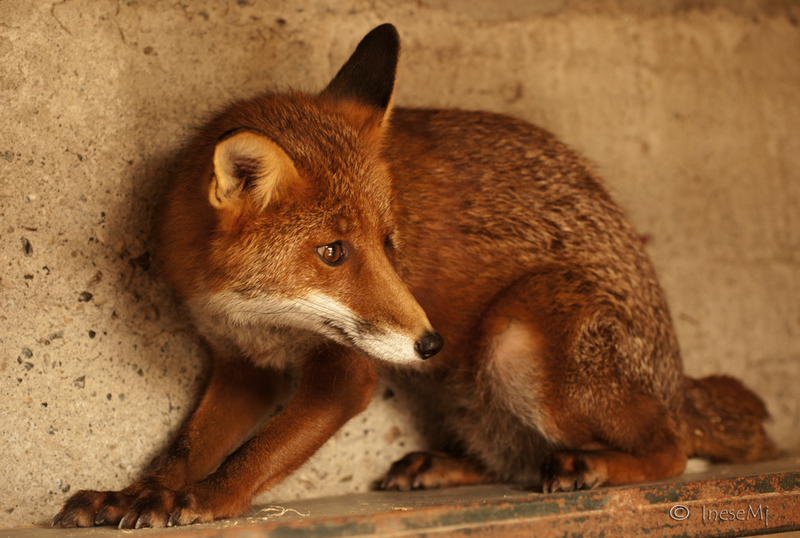 I’ve seen them skulking down the streets late at night, I’ve seen a fox perched on someone’s garage. Recently I saw this extra cute fox cub running in and out of the premises of the printing press opposite my residence, but I have never seen a perfect and mutual symbiosis between people and foxes before. Well done Pat!!. Thank you so much for this comment! Yes, humanity has spread, and feeling superior people don’t think that they have taken somebody’s territory, especially if this “somebody” is just a wild animal… I also know that some people keep the foxes as pets, and sell them too… If you see a cute cub, let him walk away: if you touch him the other foxes might kill him because of the human smell. 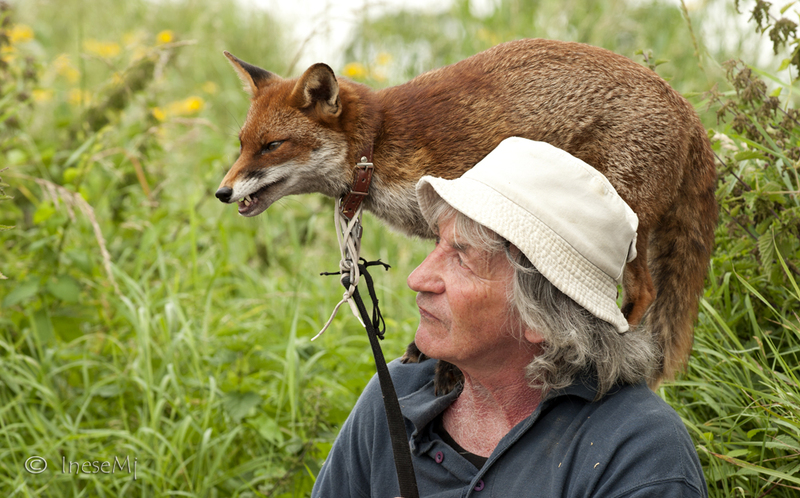 Pat didn’t take a healthy fox out of the natural habitat. He saved a dying animal. Thank you again for accepting the nomination and for your kind words. Have a great weekend! Thank you for your kind words! It is the same here, all the hunting. You know The Little Prince? He once said: You become responsible, forever, for what you have tamed. I’ve only seen one here in the wild and that was quite a while ago – I believe the constant construction on South Florida has eliminated these poor creatures. People have a tendency to become a plaque in some areas – at least as far as their damage to Nature. May be they have to be educated – both on the Nature and on their humanity. We can only keep trying to enlighten them! Thank you for your kind comment! You are so right, the love is palpable there. This man is a story himself. Well, not too wild anymore:) Thank you for stopping by! Wow you are in Ireland! I didn’t realise that. (I see you are in Co. Tipperary, now I have looked!) I normally just look at people’s photos as I am suffering from a chronic illness that affects my concentration and reading and writing are quite a challenge for me. I struggle to do my blog, so may not be up to doing the award stuff, though I am very honoured to be nominated. My sister and her husband and two kids live in Dublin. We are Aussies. She is coming to visit us next week for the first time n 2 years and the first time ever without the kids. I was enthralled by this story and made sure that my Mum (with whom I live and who cares for me along with my Dad) had a look at all the photos. 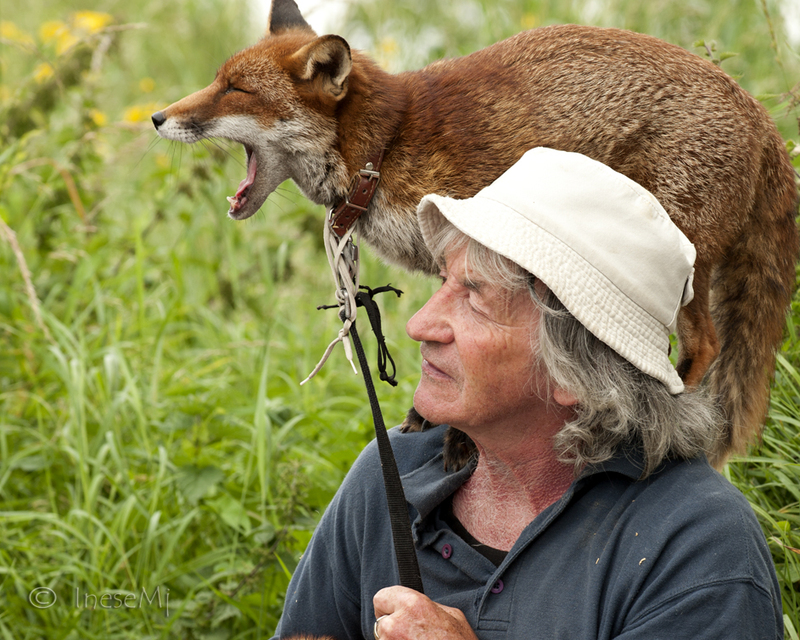 We are big dog fanatics, so anything to do with dog like creatures like foxes and wolves is fascinating for us. So glad you like the story, Katherine! I know many Irish who emigrated to Australia, but only one girl who emigrated from Australia:) How did it happen that your sister has moved to Ireland? She must be married with an Irishman? Hope that you have more good moments than bad moments and keep doing your blog. You are amazing! I know that your example inspires the others who suffer and struggle. You deserve any possible award ever. My best wishes and thought to you! Great gallery of photos, dear Inese. Also thanks for linking to my blog, as regard to your newest award and congratulations on it.